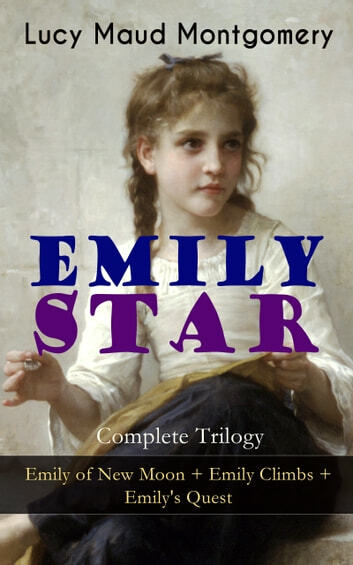 This carefully crafted ebook: "EMILY STAR - Complete Trilogy: Emily of New Moon + Emily Climbs + Emily's Quest” is formatted for your eReader with a functional and detailed table of contents. The author, Lucy Maud Montgomery, created another and better-known representative of Canadian girlhood in "Anne of Green Gables" and all the subsequent Anne books, but Emily was closer to her own heart. Like Anne, Emily is a strong-minded, gifted, imaginative child, left alone and unprotected in a harsh world, who is taken in by adults who are at least initially cold and unloving. Both girls grow up amid the beauties of Prince Edward Island, both keenly sensitive to natural splendors and highly fanciful, not to say occasionally precious, about assigning names to lakes and trees and identifying spirits and fairies in their surroundings. Anne is an original and spunky girl, with a certain amount of talent for writing verses and romantic tales, but Emily is a writer. In the celebrated Emily trilogy, of which Emily of New Moon is the first volume, Montgomery draws a more realistic portrait of a young girl's life on Prince Edward Island. The twin threads of bright and dark, love and cruelty, hope and despair intertwine in a pattern as significant as it is enduring. In the second volume, Emily Climbs, Lucy Maud Montgomery traces the often stormy course of Emily Starr's life as she moves from the world of childhood into that of school and adolescence. Emily's Quest is the last of the Emily trilogy. After finishing Emily Climbs, Montgomery suspended writing Emily's Quest and published The Blue Castle; she resumed writing and published in 1927. Lucy Maud Montgomery (1874-1942), was a Canadian author best known for a series of novels beginning with Anne of Green Gables. Montgomery went on to publish 20 novels as well as 530 short stories, 500 poems, and 30 essays.